Satisfying Protein Pancake was posted on May 6th, 2016 and is filed under Breakfast, Gluten Free, Low Carb, Protein, Recipes. This entry has 4 comments. You can follow any responses through the RSS 2.0 Comment Feed. 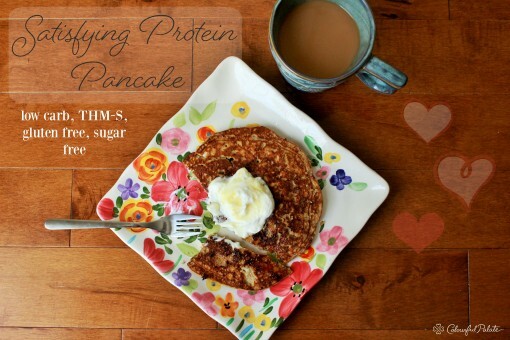 There was a popular protein pancake that went viral on the internet a while ago. I used to make it all the time…but it largely used a banana for the base of the recipe. This is okay, but I wanted to keep the recipe lower carb/low in sugars, so I stopped making it. And I started to miss it. Then yesterday, I thought why couldn’t I replace the banana with a thick yogurt. 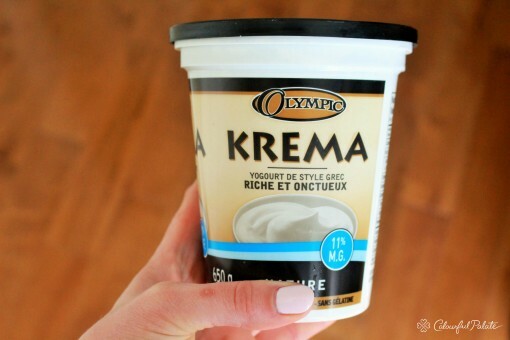 Enter Olympic Krema Greek Style Thick & Rich Yogurt. Hands down, this has been one of my favourite yogurts. It’s so thick and creamy…and it’s my favourite bedtime snack. I have bought it for years and it has been the STAR of my sugar-free, low carb frozen yogurt recipes! (Try this irresistible strawberry froyo or the blueberry flavour and thank me later!). This breakfast is a fantastic start to your day as it has protein, a little healthy fat, and a TON of fibre! With it’s low carb count it won’t become human padding AND it will get you burning fat right off the bat! This protein pancake serves one. Directions: Mix all ingredients until smooth. Cook in frying pan until little bubbles come up on top and the edges feel solid. Flip and finish cooking. 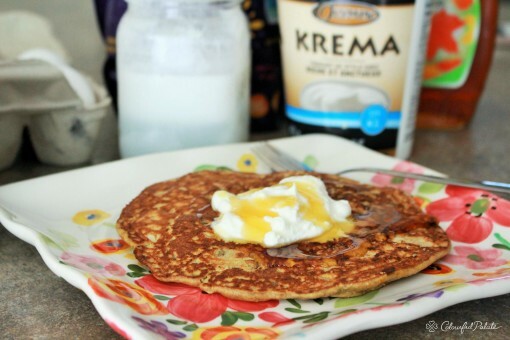 Top with more Olympic Krema Yogurt (I like mixing a little vanilla stevia in first) and a drizzle of sugar-free syrup or a low sugar fruit like raspberries or blueberries. I love that this company is Canadian and all their products are made in Delta, B.C. with 100% natural ingredients. They also have an Olympic Vanilla Kefir that just came out, alongside the plain and strawberry flavours. For those of you who might not know, kefir is a probiotic, fermented milk that contains 2 billion probiotics (per 250 ml) and is great for a healthy digestive flora. Olympic Kefir is organic, contains 10 different bacterial cultures and is low fat with only 1% M.F. Seriously one of my favourite bevys. It’s local, organic, and refreshingly smooth. 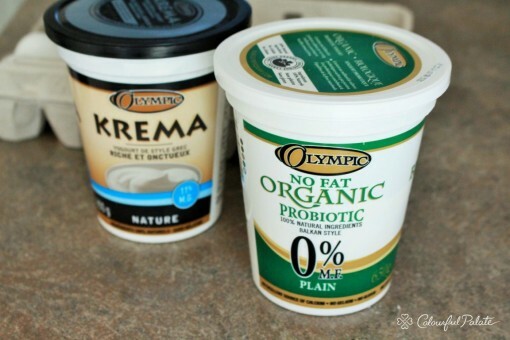 Definitely try other Olympic Dairy products like Olympic Organic Probiotic Yogurt, you will love. For more recipe inspiration using Olympic Dairy products, visit their website. Did you ever get into the protein pancake phase? What’s your favourite recipe to use Greek yogurt in? Disclaimer: Although this post has been generously sponsored by Ultima Foods, the opinions and language are my own. This recipe is genius! I love the ingredients in this pancake. I’m always searching for the perfect pancake for me and I think using yogurt may be it. Love the idea of achieving that buttermilk flavor without using buttermilk. I was just talking about pancakes with my family and how my dad loves his pancakes dense and thin and how I love mine thick and fluffy. This pancake looks like the perfect compromise while still having a healthy twist. What a superb twist! I have got to try this and that yogurt sounds amazing! I just tried this! I used vanilla greek yogurt and vanilla protien powder. I doubled it because I hadn’t had lunch and it was for dinner! I am stuffed!! I did not need to double it! I thank you for this. I love pancakes but trying to not eat the bad flour and fat. Your pancake is looking yummy. I never heard that the pancake could be made with Yogurt.